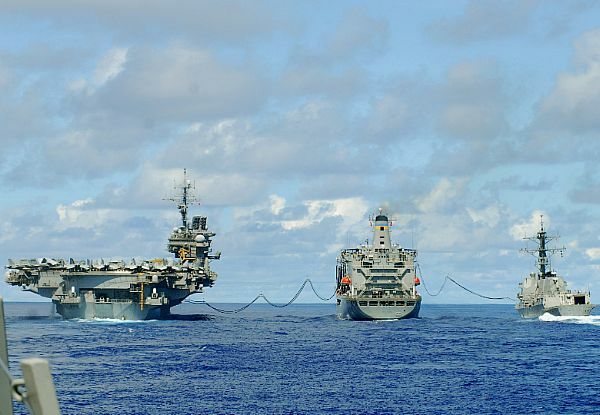 PACIFIC OCEAN (Aug. 10, 2007) - Fuel lines connect USS Kitty Hawk (CV 63), Arleigh Burke-class guided-missile destroyer USS McCampbell (DDG 85) and the Military Sealift Command fleet replenishment oiler USNS John Ericsson (T-AO 194) during a replenishment at sea (RAS). Kitty Hawk and McCampbell are currently participating in Valiant Shield 2007). U.S. Navy photo by Mass Communication Specialist Seaman Bryan Reckard. 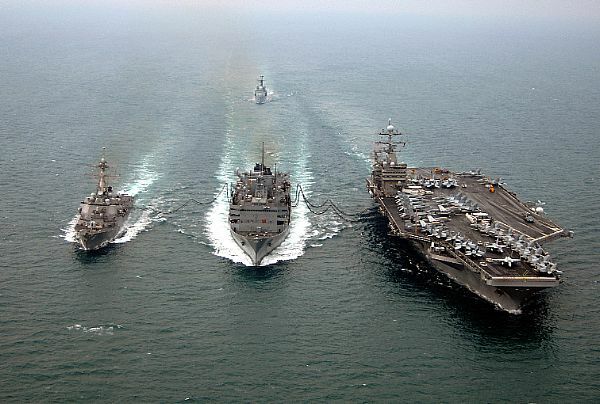 PACIFIC OCEAN (Aug.14, 2007) - USS Nimitz (CVN 68 ), USS Kitty Hawk (CV 63) and USS John C. Stennis (CVN 74) Carrier Strike Groups transit in formation during a joint photo exercise (PHOTOEX) during exercise Valiant Shield 2007. 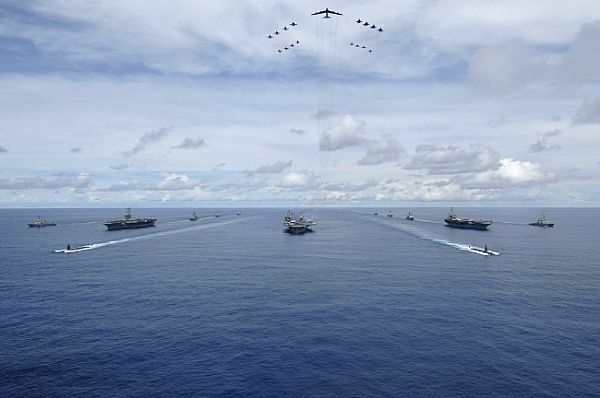 The aerial formation consists of aircraft from the carrier strike groups as well as Air Force aircraft. 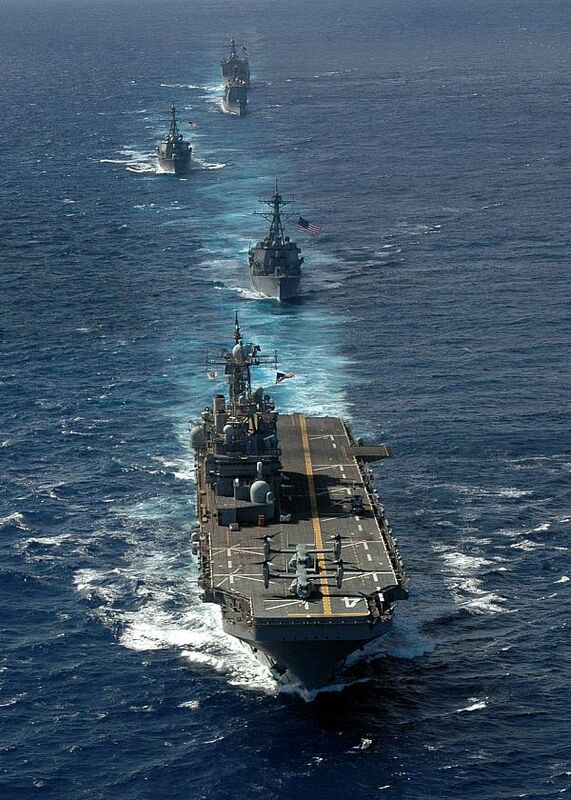 The strike groups are participating in Valiant Shield 2007, the largest joint exercise in the Pacific this year. 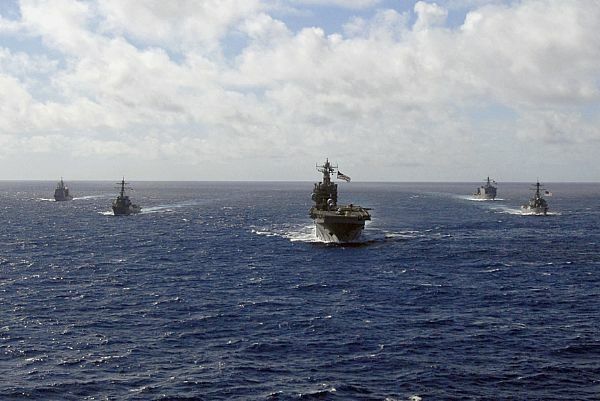 Held in the Guam operating area, the exercise includes 30 ships, more than 280 aircraft and more than 20,000 service members from the Navy, Air Force, Marine Corps, and Coast Guard. 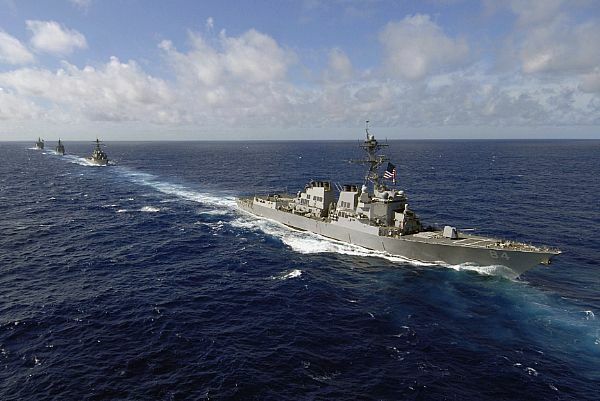 U.S. Navy photo by Mass Communication Specialist Seaman Stephen W. Rowe. 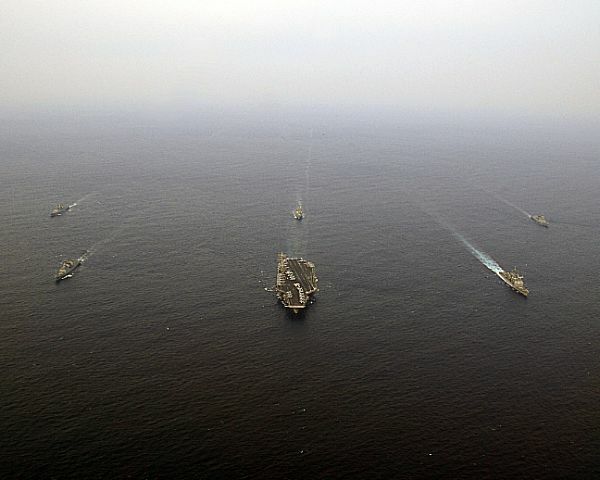 ARABIAN SEA (May 22, 2007) – Ships assigned to the John C. Stennis Carrier Strike Group, Nimitz Carrier Strike Group, and the Bonhomme Richard Expeditionary Strike Group transits through the Gulf of Oman. 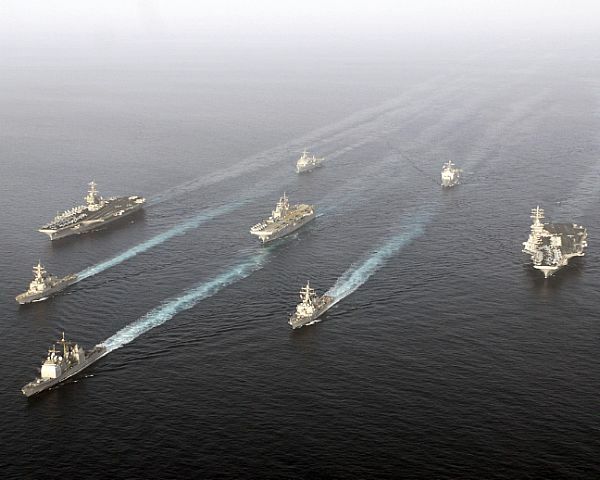 The three strike groups are in support of Maritime Operations. 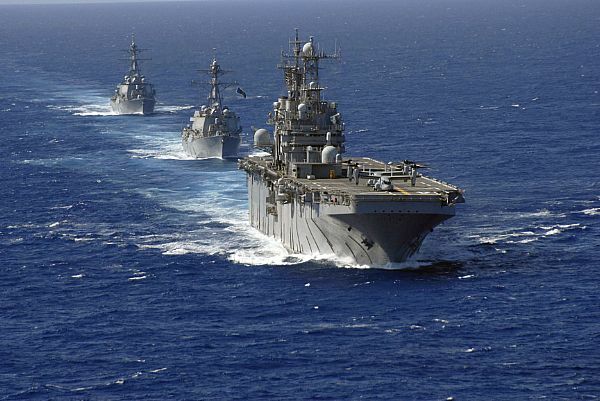 Maritime Operations help set the conditions for security and stability, as well as complement counter-terrorism and security efforts to regional nations. 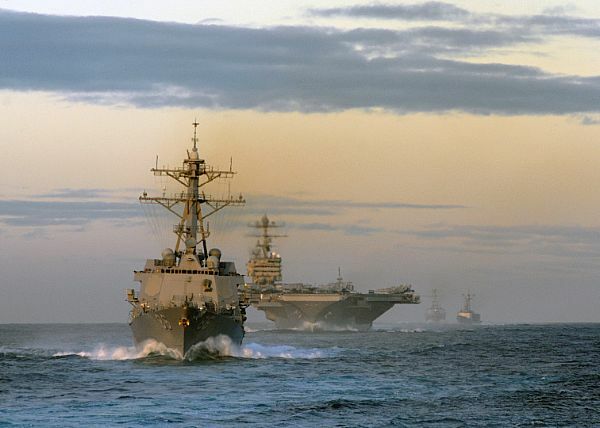 PACIFIC OCEAN (Jan. 26, 2008) Ships assigned to USS Abraham Lincoln Strike Group, trail behind the guided missile destroyer USS Momsen (DDG 92) during a straight transit exercise. 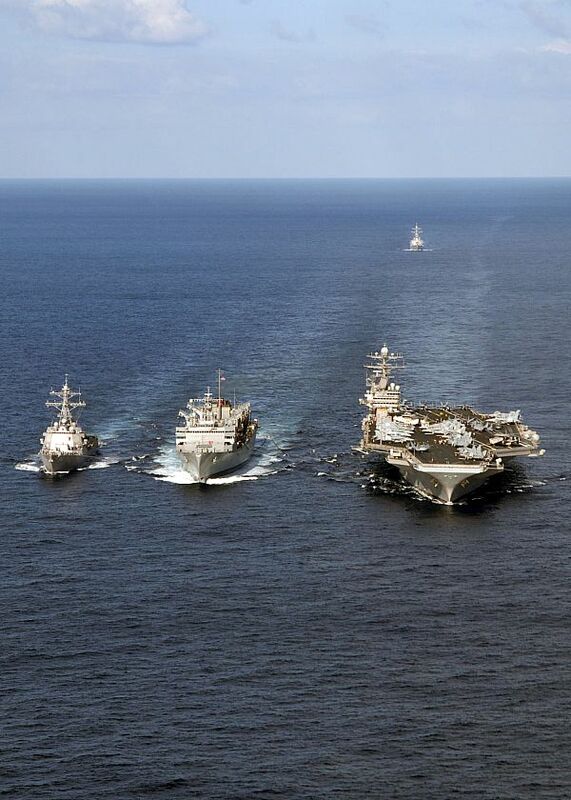 Ships and aircraft assigned to Carrier Strike Group (CSG) 9are underway off the coast of Southern California participating in Joint Task Force Exercise. PERSIAN GULF (Jan. 23, 2008) The Arleigh Burke-class guided-missile destroyer USS Winston S. Churchill (DDG 81), left, performs an emergency breakaway maneuver during a replenishment at sea with the Military Sealift Command fast combat support ship USNS Arctic (T-AOE 8 ), the Nimitz-class aircraft carrier USS Harry S. Truman (CVN 75) and the British destroyer HMS Manchester (D 95). Truman and embarked Carrier Air Wing (CVW) 3 are on a scheduled deployment in support of Operations Iraqi Freedom, Enduring Freedom and maritime security operations. PACIFIC OCEAN (Feb. 22, 2008) Carrier Strike Group (CSG) 11, led by the aircraft carrier USS Nimitz (CVN 68 ), steams in the Pacific Ocean after recently completing exercises with several Japanese Maritime Self Defense Force ships. 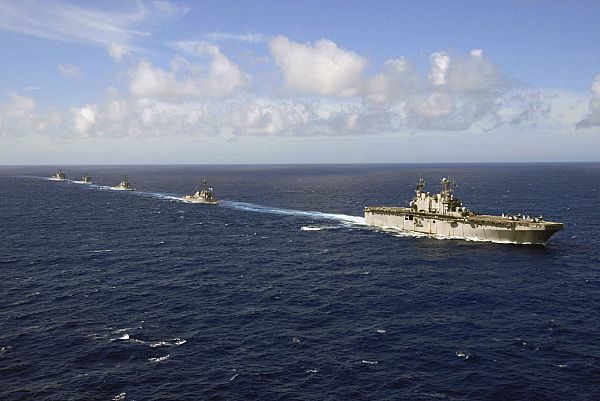 Nimitz is operating in the western Pacific and Indian oceans as part of the U.S. 7th Fleet. 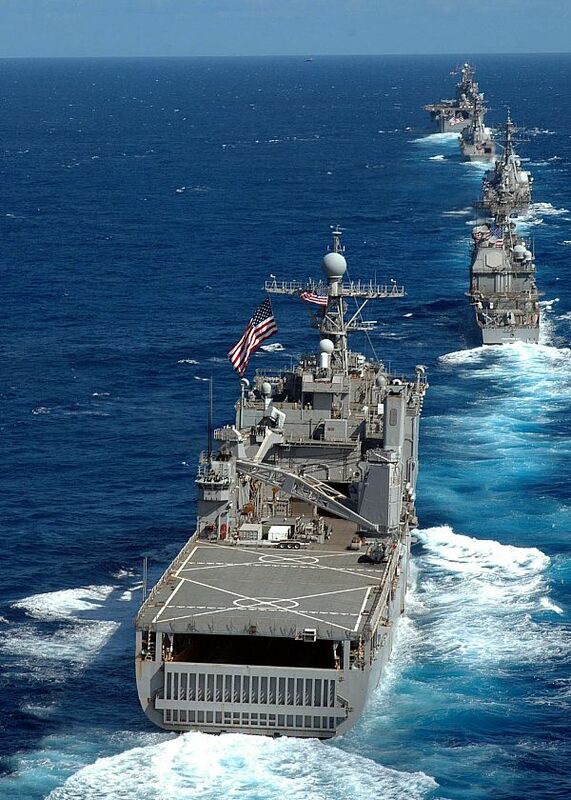 ATLANTIC OCEAN (Feb. 25, 2008) The amphibious assault ship USS Nassau (LHA 4), center, leads a formation of ships during an Atlantic crossing of the Nassau Expeditionary Strike Group. 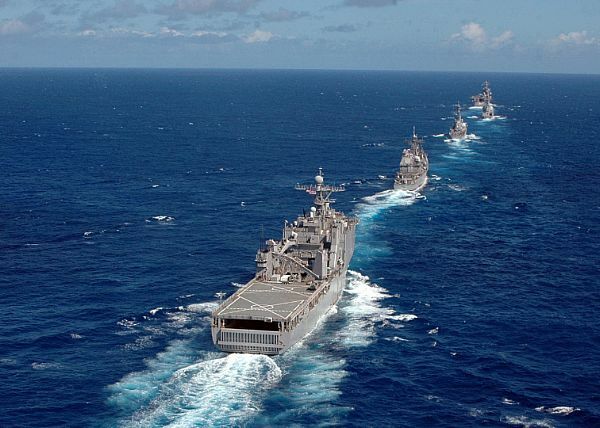 U.S.
ATLANTIC OCEAN (Feb. 25, 2008) The amphibious assault ship USS Nassau (LHA 4) leads a formation of ships during an Atlantic Ocean crossing of the Nassau Expeditionary Strike Group. 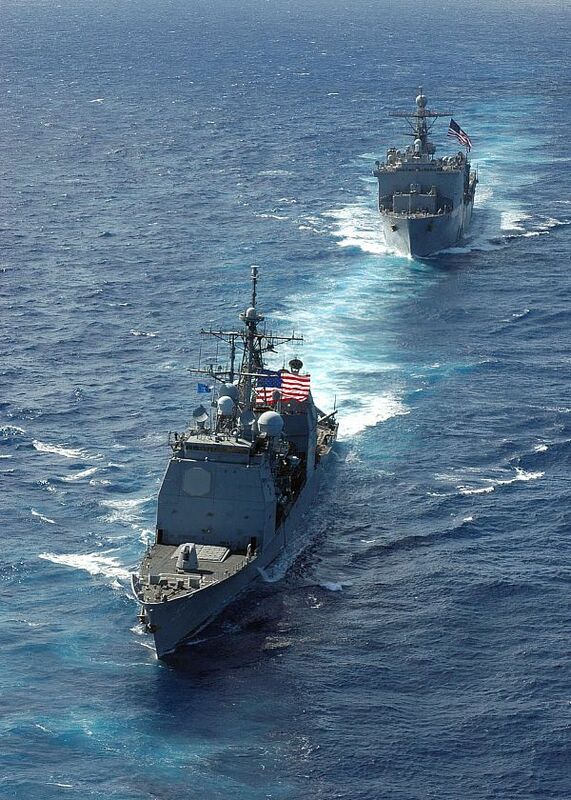 U.S.
ATLANTIC OCEAN (Feb. 25, 2008) The guided-missile destroyer USS Bulkeley (DDG 84) leads a formation of leads a formation of ships during an Atlantic Ocean crossing of the Nassau Expeditionary Strike Group. U.S.
ATLANTIC OCEAN (Feb. 25, 2008) The amphibious dock landing ship USS Ashland (LSD 48 ), the guided missile cruiser USS Philippine Sea (CG 58 ) and the guided-missile destroyers USS Ross (DDG 71) and USS Bulkeley (DDG 84) follow the amphibious assault ship USS Nassau (LHA 4) during an Atlantic ocean transit of the Nassau Expeditionary Strike Group. ATLANTIC OCEAN (Feb. 25; 2008) The amphibious assault ship USS Nassau (LHA 4) leads the guided-missile destroyers USS Bulkeley (DDG 84) and USS Ross (DDG 71), the guided-missile cruiser USS Philippine Sea (CG 58 ) and the amphibious dock landing ship USS Ashland (LSD 48 ) during an Atlantic Ocean transit of the Nassau Expeditionary Strike Group. ATLANTIC OCEAN (Feb. 25, 2008) The guided-missile cruiser USS Philippine Sea (CG 58 ) and the amphibious dock landing ship USS Ashland (LSD 48 ) sail in formation with the Nassau Expeditionary Strike Group during a transit of the Atlantic Ocean. 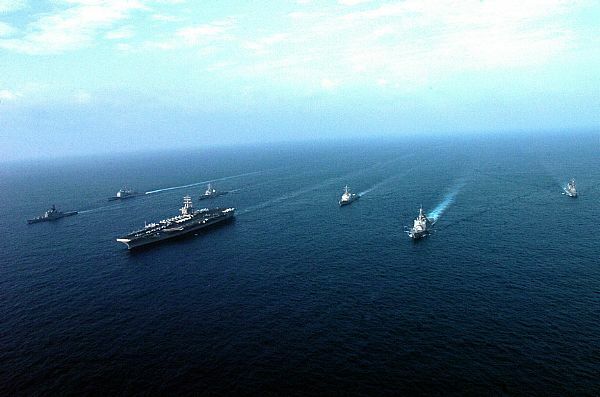 PACIFIC OCEAN (March 6, 2008) The aircraft carrier USS Nimitz (CVN 68 ) leads Carrier Strike Group 11 and several Republic of Korea ships in formation while participating in Exercise Key Resolve/Foal Eagle 2008 (KR/FE 08 ). KR/FE 08 is an annual joint exercise involving forces from the United States and the Republic of Korea. 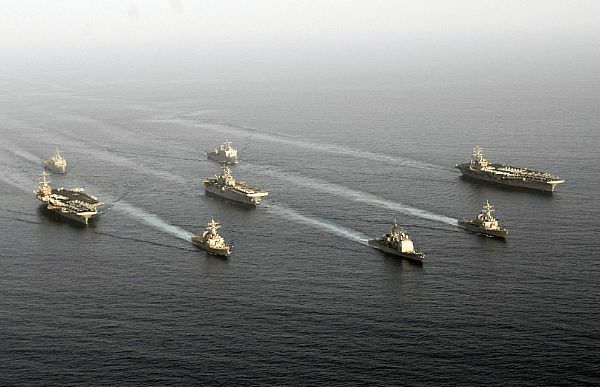 Navy ships in the Arabian Sea, Gulf of Oman area. Scenes include aerial footage of individual and multiple ships in formation including the USS Stenis, USS Bonhomme Richard and USS Rushmore, helicopters flying with ships, and some interior footage looking out from inside the helicopters. ATLANTIC OCEAN (March 27, 2008) The Nimitz-class aircraft carrier USS Theodore Roosevelt (CVN 71), right, the Military Sealift Command fast combat support ship USNS Supply (T-AOE 6) and the guided-missile destroyer USS Nitze (DDG 94) sail side-by-side during a replenishment-at-sea. Roosevelt and embarked Carrier Air Wing (CVW) 8 are conducting tailored ship's training availability and final evaluation problem.